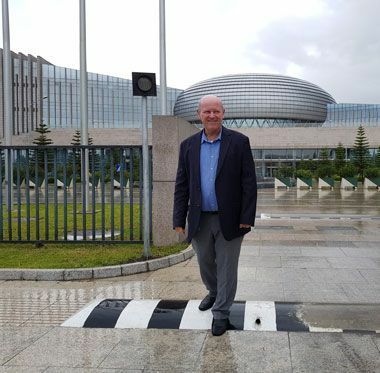 Alain St.Ange of Saint Ange Tourism Consultants has embarked on a working mission that will take him in June and July to four mainland African Countries working alongside Tourism Ministries and their Promotional Boards, Private Sector Organisations and other tourism related bodies. He started his five country mission this week in Addis in Ethiopia and is set to also be in the DRC, Ghana, Kenya and South Africa in the coming weeks. In Addis among his different meetings he completed on Wednesday a successful working session with a group of Private Sector entrepreneurs who had come together to ensure their businesses remain relevant in Ethiopia's Tourism Industry. "We discussed their visibility and how to increase it to ensure relevance. We discussed key USPs and the need to use their destination's strengths in their own drive" said St.Ange in Addis. Alain St.Ange is the successful and popular former Minister for Tourism, Civil Aviation, Ports and Marine of the Seychelles who launched his own tourism "Saint Ange Consultancy" a year ago after missing out on the position of Secretary General at the UNWTO (United Nations World Tourism Organisation) when Seychelles under pressure of the African Union (AU) withdrew the island's candidature. He is now a sought after speaker at tourism conferences and is also responsible for the weekly "Saint Ange Tourism Report" that is reposted on most of the important tourism news wire right across the world. Alain St.Ange was First President of the Indian Ocean Vanilla Islands and is today the President of the Seychelles Labor Union (SLU), Deputy Secretary General of FORSEAA (Forum of Small Medium Economic AFRICA ASEAN) based in Jakarta Indonesia, listed as a Consultant for TMN (Travel Marketing Network) in New York USA, Co-Chair of the SUNx (Strong Universal Network) Organisation in London UK, Vice President & Founding Member of ICTP (International Coalition of Tourism Partners) and a Member of the Advisory Board of the non-profit organisation "Helping Needy Welfare Society of India" . Alain St.Ange studied Hotel Management in Germany and Tourism Administration in France. He has been involved in the industry's private sector trade in hotels and restaurants in Germany, the Channel Islands, Australia and in the Seychelles before joining the Tourism Board of Seychelles as Marketing Director before being promoted to the position of CEO. Αναρτήθηκε από geop στις 8:40 π.μ.